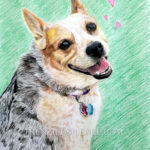 I’ve been working all summer on lots of pet portraits! Here are just a few of them :) Commissions are open for pet and human drawings! Please visit my request page for more information!